Help! My dog chews everything in sight! 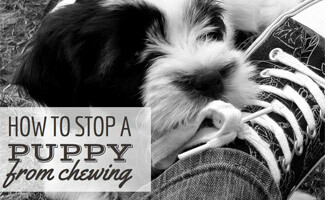 Is your puppy chewing on everything? You’re not alone! 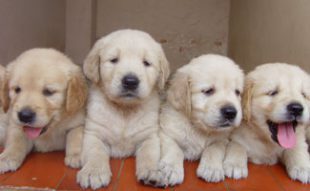 Puppies (like babies) go through a teething process which lasts about 6 months. This is how your pup learns — by exploring this big world. But how do you stop her from destroying everything in your home? 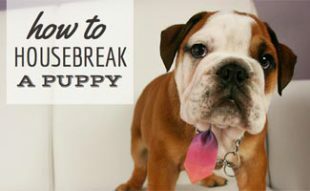 Try some of these tips to learn how to stop a puppy from chewing. If your dog is chewing on something she shouldn’t, immediately replace that item with something she can chew on like a chew toy. This is correcting the behavior instead of punishing her. If you notice she isn’t crazy about the one you bought, buy her a different one. Dogs have preferences, so make sure she has a chew toy she likes. One we suggest is the Benebone Bacon Flavored Chew Toy. This is a bacon flavored wishbone chew toy that has a long lifespan. But be careful, once you see that the toy is beginning to wear (cracks, breaking apart, deep teeth marks, etc.) you’ll want to replace it. Puppy proof your home by blocking your pup from anything she shouldn’t be chewing on and putting away anything she shouldn’t have. Does she love to chew on shoes? Put all of your shoes out of sight so she can’t sink her teeth into them. Is she a fan of chewing on the molding? Get a puppy pen or put her in a crate for short periods of time when you can’t keep an eye on her. Watch your dog whenever she’s roaming about. She doesn’t know the house rules yet, so it’s up to you to show her. Let her know when something is off-limits. If she’s quite the terrorizer, keep her on a leash inside so she’s close to you at all times. Sometimes dogs chew things up because they want your attention. Make sure you give your dog plenty of attention. If you have her chained up all day she’s not getting the affection she needs to learn what is acceptable behavior and what is not. If your dog is sneaky (or you’re just bad at keeping an eye on her) try getting a taste deterrent like Bitter Apple . But be careful, these don’t always work and some dogs will still chew on the item. So, be sure to always supervise your dog when you try something new. Punishing your dog is not the answer. 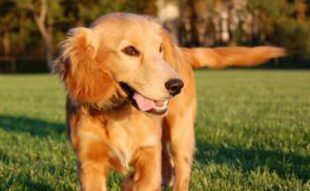 Punishment is not an effective way to train your dog and often it can provoke other undesired behaviors. Your dog most likely won’t associate the punishment with the “crime.” And, if she is giving you a “guilty” look it’s not because she feels guilty. Dogs give this look when they feel threatened. So instead of feeling guilty, she is actually scared of you because she can tell you are angry and upset but doesn’t understand why. Keep in mind that your dog is like a baby. You wouldn’t punish your baby for spitting up on your shirt, so don’t punish your dog for chewing on a shoe that you should’ve kept away from her 😉 . Are shoes your dog’s favorite chew toy? Here are some specific tips related for those of you with a “shoe chewer” on your hands. 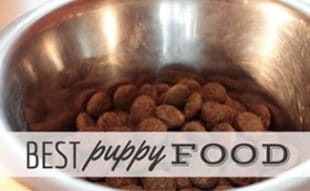 If you are prepared to manage your dog’s behavior, you may be able to stop puppy chewing right from the start. We hope these tips have helped stop dogs from chewing all over the world. While it may be fun to get new shoes, it’s not fun to spend all your cash on replacing chewed up shoes! What did you do to stop dog chewing? I have one 8-month old pup who just recently started chewing on my leather furniture. We’ve had him for five months, and he has plenty of chew toys and a brother to play with, but I came home last week one day after being away for a few hours (which I have done several times before with no issues) to discover a hole chewed in the arm of my recliner. He never chews on it when I’m home, but since then, he has begun chewing on the arm of the leather couch as well – again, when I’m away from home. I hate to have to start crating him again since he has been so good until now, but I can’t let him chew on the furniture and I can’t be home all the time. If he did it when I was here, I would redirect him and offer him a chew toy, but since he does it when I’m away, I don’t know how to fix the behavior. Any ideas? If I were in your shoes, I’d start crating him again. We’re experiencing a similar thing with our dog Sally except she’s not chewing on furniture, she’s getting into food. We went a long period of time without crating her and now when we leave the house she eats food or chews up items in our recycling bin. With your dog, I would slowly increase the time you leave him out. Start with 15 minutes and be outside or in another room, then increase gradually to 30 minutes, then 1 hour, etc. It could be that he’s getting bored being alone for too long and that’s why he’s become a little more destructive. Good luck! Thank you for the help. My dog has just started chewing quite a bit. I got him some new toys yesterday, as you mentioned. How often do you think that it is necessary to get new toys to keep him occupied? As long as he’s content there’s no need to get him a new toy. If he is starting to chew on other things again, getting a new toy would be a good idea.